Often, we come to the table with our own plans and dreams; how can we share our unique point of view while remaining open to the perspectives that make up our team? Alex Schmidt offers improv comedy workshops for companies, schools, senior centers, and queer communities that focus on building listening skills, improving group connection, and practicing the necessary but challenging behavior of responding to what has just been said. This process is as much as about creating compelling scenes as it is about building tools for self-awareness, practicing productive communication, and gaining trust in our colleagues and collaborators. When we are able to truly listen to each other and let the energy of the partnership carry us into unchartered realities, we create something we never could have envisioned on our own. Trust in the unknown! Alex Schmidt is a comedian and educator with 10+ years of experience training in the art of improv comedy. 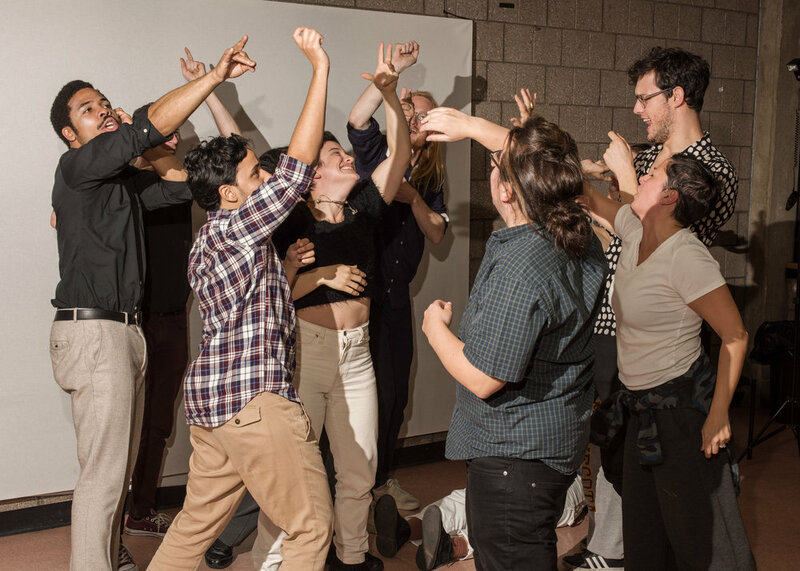 Her experiences studying with Upright Citizens Brigade (New York, NY) and performing professionally at venues including MoMA PS1, The Kitchen, and PERFORMA 17 are combined to provide a high-energy workshop that encourages creativity, connection, communication, and collaboration. Schmidt has led improv comedy workshops for a wide range of group sizes and demographics, with clients including BlackRock (NY and DE), Brooklyn Arts Council (NY), Henry Street Settlement (NY), Century 21 (NY), Vice Media (NY), TriBeCa Community School (NY), and Marymount School (NY). Interested in bringing a workshop to your company, school, senior center, queer clubhouse, local diner, or retreat space? Get in touch below!